Eric Spivack at the James Center. 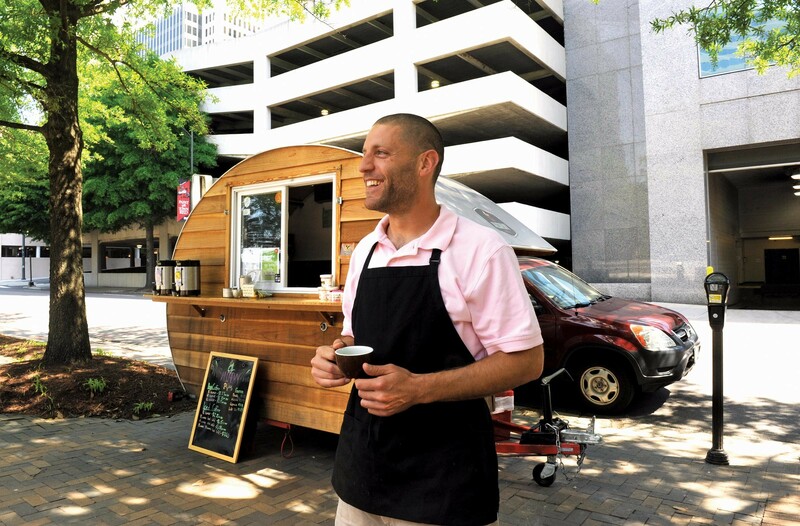 Eric Spivack takes his wood-paneled, teardrop-shaped coffee trailer wherever he thinks lovers of good coffee might congregate. And his Alchemy Coffee is serious about the good part. If Starbucks is your gold standard, don’t bother — Spivack is all about dialing in shots of espresso, explaining his newest single-origin roast, and making you feel guilty for wanting to dilute a cup of his perfectly brewed drip with milk or cream. If there’s a downside to his espresso machine’s extreme mobility, it’s that if he does manage to make a convert out of you, you might find yourself chasing his cart across the city and frantically checking his Twitter feed (@AlchemyRVA) for his whereabouts. Lately he’s been spending his weekdays at Virginia Commonwealth University and in front of the James Center downtown.